Meltaway Almond Cookies, made with an addictive cream cheese dough, rolled in sugar, and topped with an optional almond garnish! 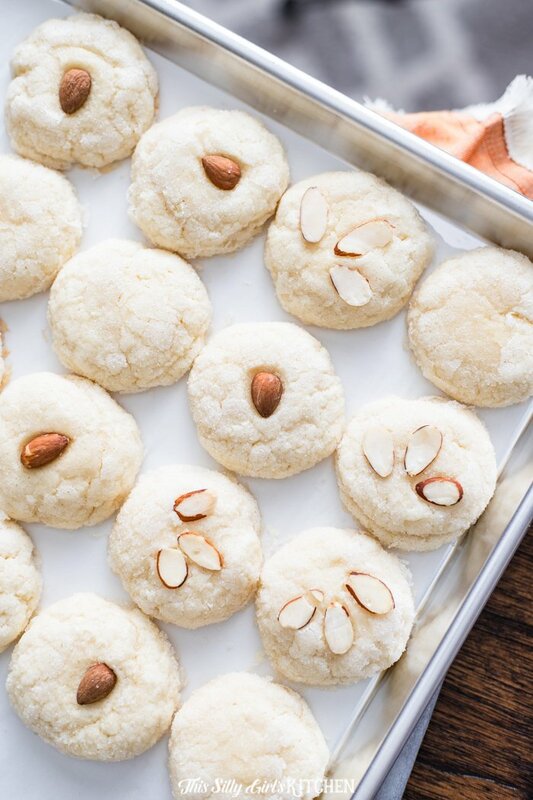 Cookie baking is one thing, but baking up my meltaway almond cookies is a whole new experience! 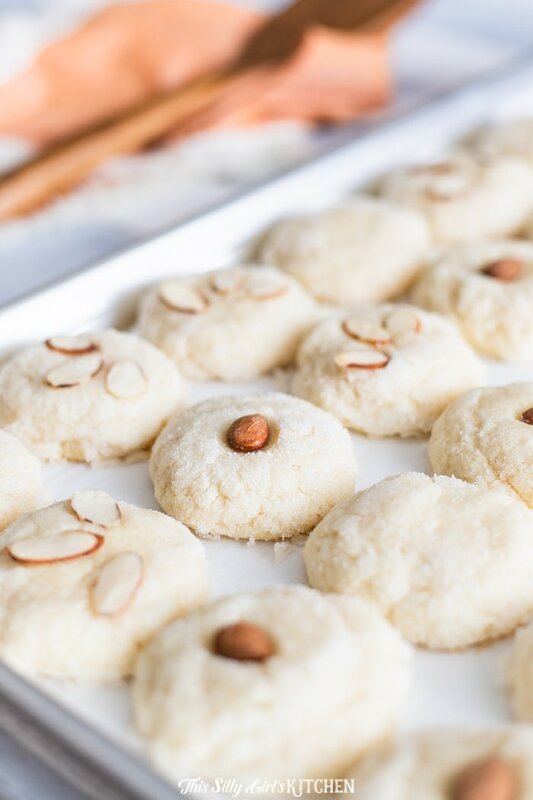 This delicious almond cookies recipe will have you salivating with every bite. Appliances mentioned in this post were supplied for free by GE Appliances for review, all opinions are 100% my own. If you’re wondering what meltaway cookies are, well that’s pretty simple to answer. Meltaway cookies are generally a shortbread style cookie made with butter, powdered sugar, vanilla, salt, flour, and cornstarch. Generally speaking, the meltaway cookies get their name from their ability to literally melt in your mouth due to their fluffy, soft texture. 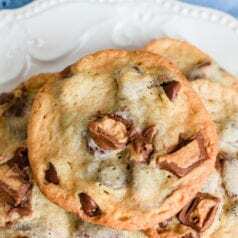 My version of meltaway cookies is a little different, using cream cheese in the batter makes these cookies just melt in your mouth while adding an additional layer of flavor. 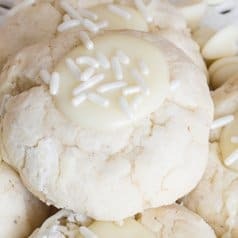 These almond cream cheese cookies are very similar to my cinnamon cream cheese cookies, except I add almond extract to the dough and roll the meltaway almond cookies in sugar instead of cinnamon-sugar. 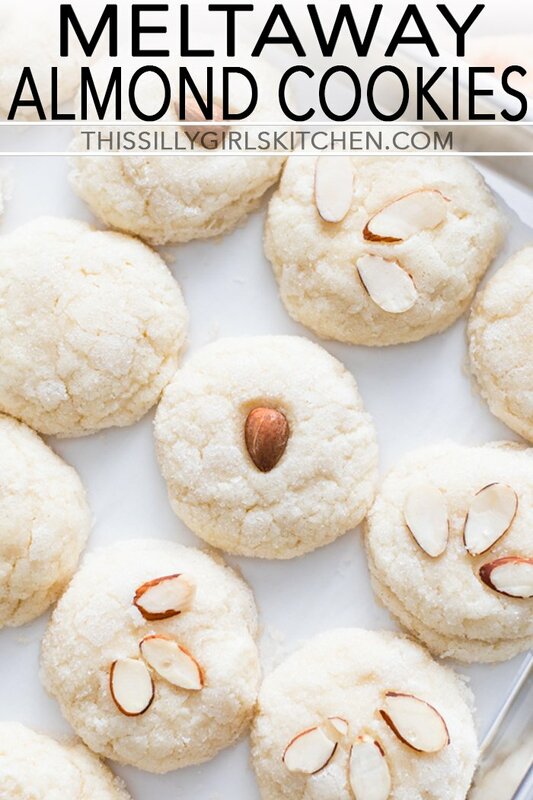 I’ve also added a few whole and sliced almonds to the top of my meltaway cookies to create a decorative touch to my almond cream cheese cookies recipe! I love to bake but I always make a huge mess no matter how careful I am. 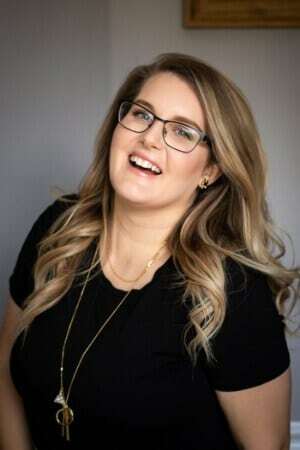 If you watch my weekly cooking series on YouTube – you know all about that! Because of my big messes, I end up using a ton of kitchen towels and using my GE washer and dryer saves the day. The key to really enjoying life as a baker I’ve found is to have the proper appliances to handle my baking and messes! My GE® 4.5 cu. 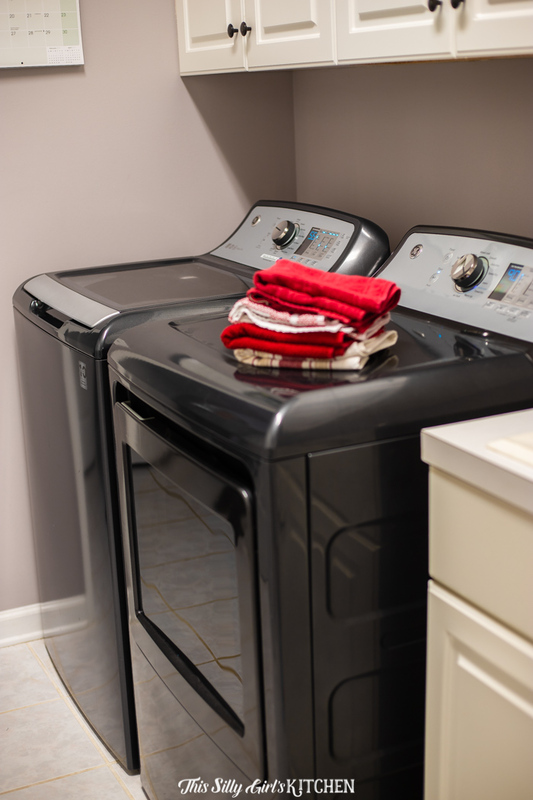 ft. Capacity Washer and GE® 7.4 cu. ft. Capacity aluminized alloy drum Electric Dryer with HE Sensor Dry truly help ensure I can get my dirty baking laundry cleaned in record time. I’m truly grateful to have GE’s washer and dryer to keep my laundry clean so that I can continue on baking without watching dirty towels pile up. What are the health benefits of almonds? Almonds contain high levels of healthy unsaturated fat as well as nutrients we need in our daily diets such as vitamin E, copper, magnesium, and high-quality protein. Almonds are usually recommended for a fiber and protein-rich diet, making them healthy for your cardiovascular health. What are almond cream cheese cookies? Almond cream cheese cookies are first and foremost very addictive! 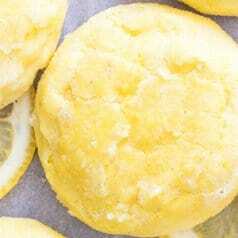 You’ll find that cream cheese cookies are very tender as well as slightly chewy in texture. 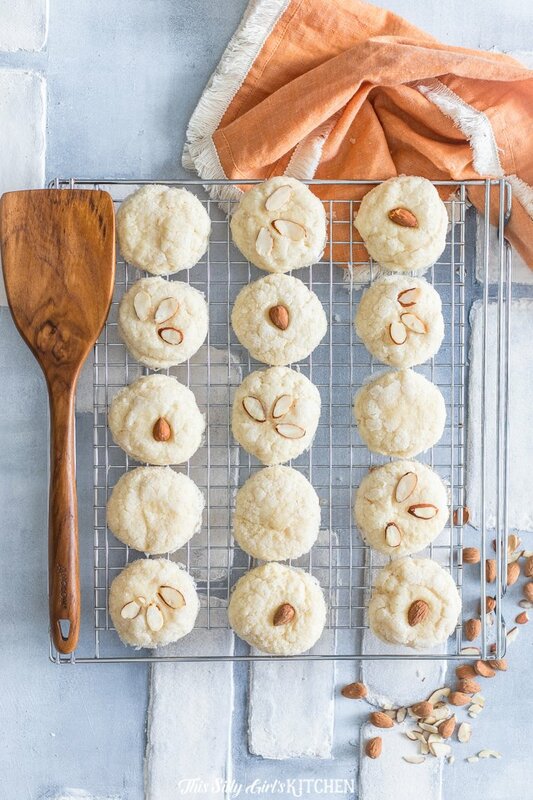 While some people enjoy a plain cream cheese cookie, these almond cream cheese cookies add a flavor that combines the nutty taste with tangy cream cheese deliciousness. 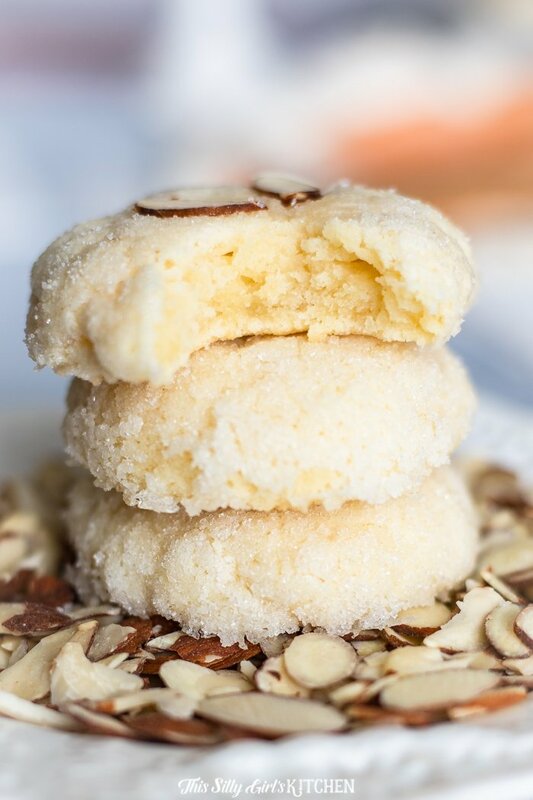 Adding to this nutty and tender flavor, the almond cream cheese cookies are rolled in sugar which brings out a nice outer texture and sweetness to the cream cheese cookie to satisfy my sweet tooth. 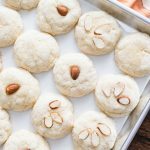 How do I Make Meltaway Almond Cookies? Cream together butter and cream cheese, mix in powdered sugar, eggs, almond extract, and flour. Allow this mixture to chillax in the fridge for at least an hour. The longer you can let these chill, the more uniform the dough balls will roll out. Roll the dough into 2 tablespoon sized balls and roll in the sugar. Be sure to only bake these meltaway cookies until they’re just set so as to avoid getting a crunchy, hard cookie. I used my GE® 30″ Drop-In Electric Range! These almond cookies are meant to be tender as one would expect from cream cheese. 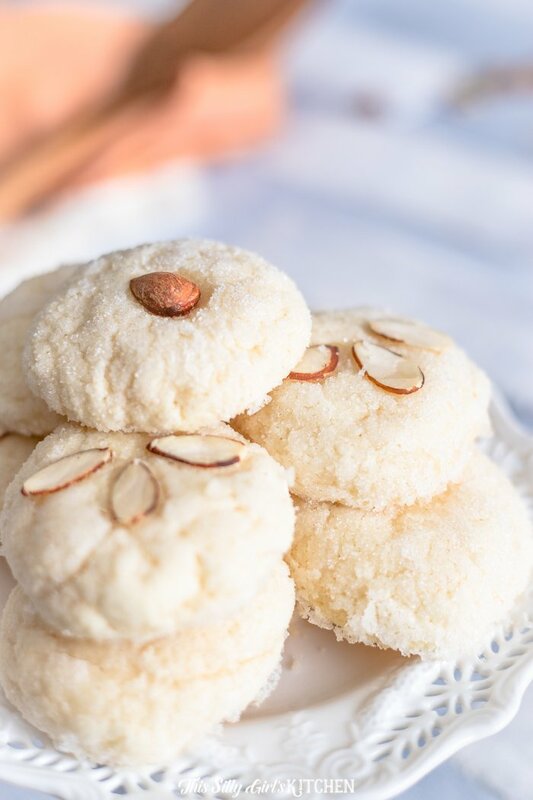 Make sure you allow these almond cookies to cool before indulging your sweet tooth with these delicious meltaway cookies. This is a very important step! Since the dough is very moist from the cream cheese and butter, the inside of the cookie may not be fully cooked immediately out of the oven. Allowing the almond cookies to cool completely on the sheet try will guarantee a fully cooked cookie that is tender on the inside, slightly crunchy on the outside from the sugar! Can I freeze almond cream cheese cookies? Be sure to store the almond cream cheese cookies in an airtight container. You may freeze your almond cream cheese cookies for up to three months, as long as you have them in an airtight container. In a large bowl, cream together the butter and cream cheese with a hand mixer until smooth. Slowly add the powdered sugar a little at a time until combined. Add in the egg, baking powder, vanilla, almond extract, and salt. Mix to combine. Add the flour in slowly until fully incorporated, scraping the sides as needed. Place in the fridge for at least one hour to rest. Preheat oven to 375 degrees. In a small bowl, add the sugar. Set aside. Roll dough into 2 tablespoons sized balls. Roll the dough balls in the granulated sugar until coated. Roll a second time in the sugar for an extra crunchy exterior. Place on a parchment lined cookie sheet about 2 inches apart. Decorate the tops of the cookies with the whole and sliced almonds, this step is optional. With the flat bottom of a glass, slightly press down the tops of the cookies, do not fully flatten, we are just looking for an evenly flat top. Bake for about 12 minutes, until just set. Do not overbake, it is hard to tell when these cookies are ready, they will puff up but won't get golden brown on the top, the bottoms will appear slightly golden. Let cool on baking sheet until completely cool. Cookies will continue to cook and set up in the center on the baking sheet, this is a very important step.